It’s definitely summer, with plenty of heat. Fortunately, however, we’ve seen few fires in our area so far. Summer also brings many guests, short and long-term visitors. We’ve enjoyed sharing the Dharma with them and how they jump so fully into community life. Summer vegetables abound, and forest works continues to be a high priority. You should see what we’ve done this year! The dappled light that comes through to the floor of a healthy forest is a delight to behold. 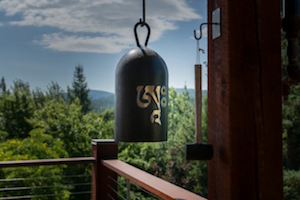 Check out the beautiful sangha life photos by Gen Heywood. And, as always, we welcome your visit. On July 7, the The Wall Street Journal published an op-ed article by His Holiness the Dalai Lama that was extracted from Approaching the Buddhist Path , co-authored by His Holiness and Ven. Chodron, to be released by Wisdom Publications in two weeks. You can read the thought-provoking article here and listen to Ven. Chodron’s comments on it here and here. Approaching the Buddhist Path is the first of a multi-volume series about the path to awakening entitled The Library of Wisdom and Compassion . Pre-order it here and read the review in Publishers Weekly. Enjoy the book and add your comments on Amazon. Ven. 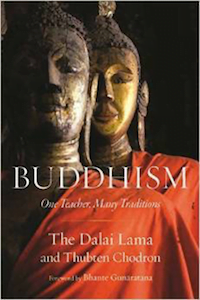 Chodron will give some Bodhisattva Breakfast Corner talks on the new book, so look for those in the next month. Each year the Abbey holds a week-long deity retreat combined with lamrim meditation. Since Dagri Rinpoche had just given the White Tara jenang, we meditated on White Tara at this year’s retreat. White Tara has the same realizations as all the other Buddhas, but her specialty is long life. Ven. Chodron taught the visualizations and steps of the sadhana—the text of the meditation—which is a profound psychological method for helping us gain the confidence that we can become a Buddha. The steps in the sadhana also relate to the lamrim, as we do practices to purify and to collect merit, and contemplate refuge, bodhicitta, and emptiness. There is something about Tara’s beauty and her stillness that helps our mind to settle down and focus on what is important in life. Ven. Chodron also taught on the “Eight Dangers,” compelling verses by the First Dalai Lama drawing metaphors for our afflictions. Watch the teachings here. At the conclusion of this retreat, everyone commented how useful the retreat was and eight people took refuge and the lay precepts. Low Hsiao Yin visited the Abbey two years ago and then moved here last spring to become an eight-precept holder (anagarika). Leaving her business career in Singapore, she trained “in the blues”—the blue outfit that anagarikas at the Abbey wear. After a year of such training, she decided that the path of monastic ordination was for her, and received novice (sramanera) and siksamana precepts. 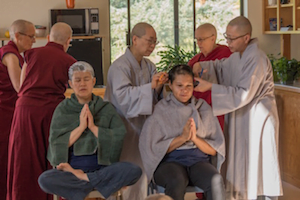 A van-load of monastics from the Chinese tradition—four bhikshunis and one bhikshu—came from Portland and Seattle to support ordination of the new nun, now named Ven. Thubten Pema. Ven. Jendy again served as the acharya or training master. She has helped in some way for every Abbey ordination. As Ven. Pema abandoned the blue suit, Christina Manriquez put it on. Christina visited the Abbey last year and returned again this spring to live with the community. Having worked for the US State Department, her interests turned to spiritual practice. She is exploring monastic life slowly, taking the anagarika precepts for a year to see what it is like to live in community and to abide in precepts. She reflects on the steps to her “anagarika-hood” here. The Abbey now has 15 monastics and 2 anagarikas! Ordination photos are here. 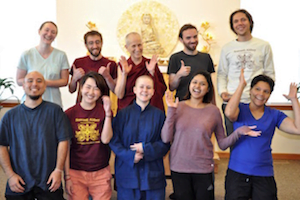 Nine young adults from very diverse ethnic, religious, and family backgrounds gathered together for a week to explore the Buddha’s teachings at the Abbey. We’ve done this program every year since 2006, and this year’s group was the most thoughtful, delving deep to contemplate the values and principles that they want to use to guide their lives. In addition to meditation, teachings, and discussion groups, they enthusiastically helped in the forest—a totally new experience for most of them who have lived in cities and towns. All said it was a life-changing experience and we hope to see many of them back at the Abbey in the future. Jyoti shares her reflections here. It felt a little like “old home week,” at Sharing the Dharma Day. On a hot July Sunday, a number of folks we hadn’t seen in a while joined with newcomers, regular attendees, and the Abbey community in the relatively cool Chenrezig Hall dining room for meditation and teaching. Ven. Chodron’s talk on motivation was powerful. She gave many examples of how we can set our intention to imbue every action of the day with Dharma. You can watch it here. Talks for Sharing the Dharma Day are based on An Open-hearted Life by Ven. Chodron and psychologist Russell Kolts. The following weekend saw what may have been our biggest crowd yet for Offering Service Saturday. Almost everyone spent some time in the forest—thinning, limbing, lopping, or hauling dead wood—while others did a beautiful job in the kitchen making sure the hungry volunteers were well fed. These volunteer days are always fun, and do they ever may make a difference in the Abbey’s workload! Thanks to all who come! The next Offering Service Saturday is August 19. Photos for both are here. Prajna House is coming along. The stem walls were poured, the underground plumbing and radon system were installed, and the slab poured. 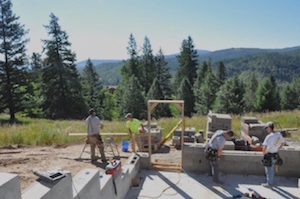 Eric and his crew are now building the walls with faswall blocks, a green product with excellent insulation that, unlike wood-framed buildings, the carpenter ants and mice don’t like to chew. Ven. Samten is making short videos of the construction process. She did one of Dagri Rinpoche blessing the construction area. Her latest one, Building a Strong Foundation, is here. Ven. 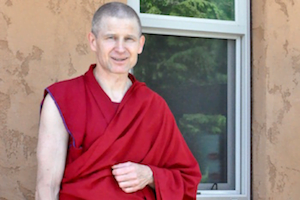 Sangye Khadro taught an inspiring retreat on the art of transforming suffering. Ven. Khadro stayed with us for twelve days. It was lovely experiencing her gentle presence, and we enjoyed the informal Q&A sessions she had with Abbey residents. She and Ven. Chodron have been friends since 1975! 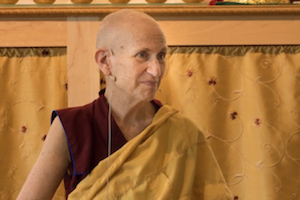 Watch the retreat teachings here. Photos are here. Ven. Losang recently completed the volunteer orientation course to visit with the inmate Buddhist group at our local Airway Heights State Correctional Institute. He will be accompanying Ven. Tarpa when she goes to teach there, hopefully beginning in August. Last year Ven. Losang visited with Vens. Chodron and Tarpa for the Airway Heights Buddhist group’s annual Buddhist Day celebration and was inspired to become a regular visitor. Although we know the men appreciate the nuns, we think they might particularly enjoy interacting with a monk. Vens. Chonyi and Tsultrim traveled to Walla Walla in southeastern Washington to meet with two Buddhist groups at the Washington State Prison and visit with the Walla Walla Dharma Sangha. It was Buddha Day for one of the groups, and they appreciated a rare special meal as well as the nuns’ sharing about the life of the Buddha. Volunteers from the Dharma group have met weekly with inmates from the five different prison sections for many years, and bring much thoughtfulness and care in their support for the inmates. Without volunteer support, inmates cannot meet and share the Dharma together. Ven. 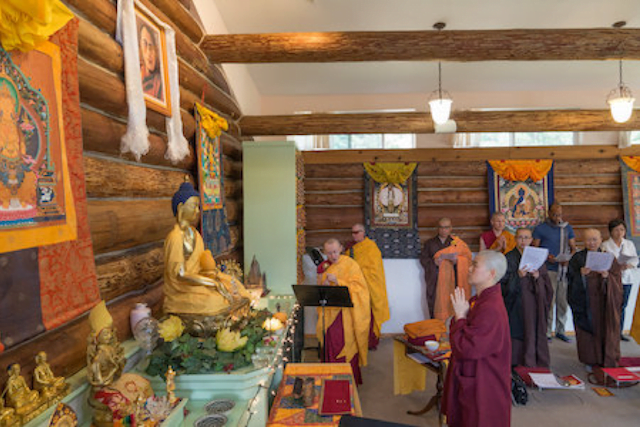 Semkye traveled to Carbondale at the invitation of the Way of Compassion Dharma Center. She gave a public talk about World Peace and a day-long retreat on the Six Far-Reaching Practices. Both were well attended. She also spent a morning at a residence for young men in addiction recovery, where she shared some of the Dharma tools for calming a busy, proliferating mind. It was a fruitful time for the participants and for Ven. Semkye. Vens. Chonyi and Jigme joined an interfaith panel for social work students at the North Idaho campus of Boise State University in Coeur d’Alene. The discussion mostly focused on death and dying from different spiritual perspectives. The nuns shared the podium with priests from the Orthodox Christian tradition, an evangelical Baptist minister, and other Christians, so they were glad to be there and help broaden the perspective of the future social workers. The students were receptive. Although the nuns’ views on good, evil, and the meaning of death were widely different from the majority, by the end of the discussion, the nuns felt they had made nice connections with their fellow panel members too. 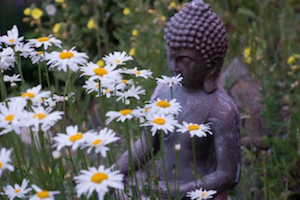 Wisdom Academy is now offering Buddhism: One Teacher, Many Traditions Part II . It’s an online course, laid out in 10-week segments, using video teachings by Ven. Chodron. Part II can be taken as a stand-alone course or as a sequel to Part I. In it, Ven. 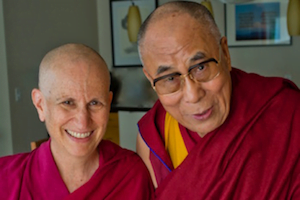 Chodron reads and explains from the book with the same title that she co-authored with HH the Dalai Lama. Part II focuses on the four establishments of mindfulness, emptiness, and the union of serenity and insight. Enrollment is live now for Ven. Chodron’s course, “Buddhism: One Teacher, Many Traditions Part II.” See details and sign up on the course site. Ven. Chodron was invited to give a talk on how Buddhists relate to death and on Buddhist funeral customs. You can find the podcast here. It is also available in both the iTunes and Google Play Store. Vens. 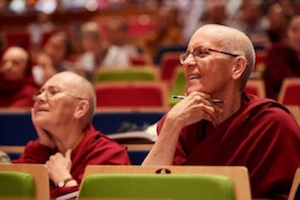 Semkye and Jampa attended the 15th Sakyadhita conference in Hong Kong. Read Ven. Jampa’s full report and take a look at the photos. Ron, one of our Singaporean friends, shares his experience of being ill in the hospital and how he used the Dharma to lessen his suffering. His story is here. Ken shares reflections about how our thoughts shape the world as an aid to calming the mind amidst current events. In another essay, he tests the theory that we all want happiness.